If there's anything I love as much as good food, it's traveling! Fortunately the BF's job as a commercial airline pilot allows us to jet set on a whim wherever our hearts desire (or at least wherever there are open seats!). We packed our bags and spent a week in California: 4 days in San Francisco, and 3 days in Napa. We ate, we drank, and we ate and drank some more. 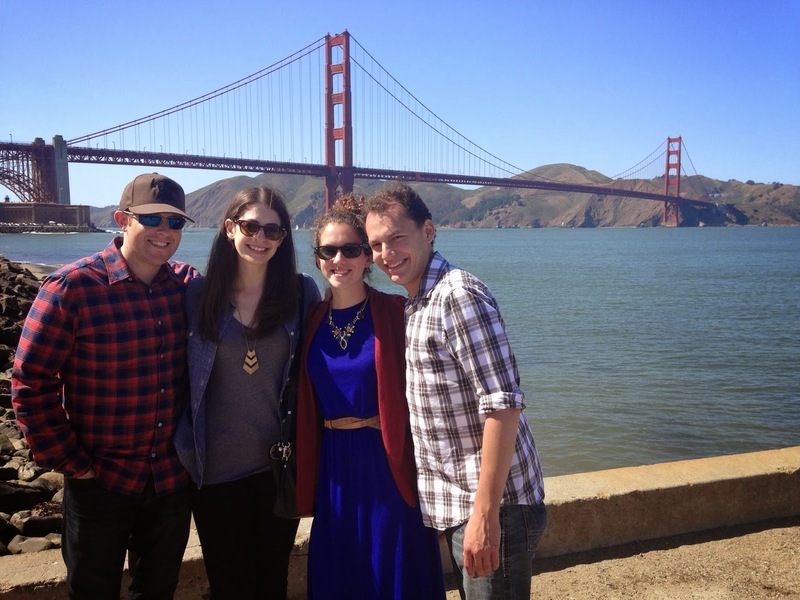 Today I'm recapping our time in San Francisco. Come back tomorrow for a recap of our visit to wine country! 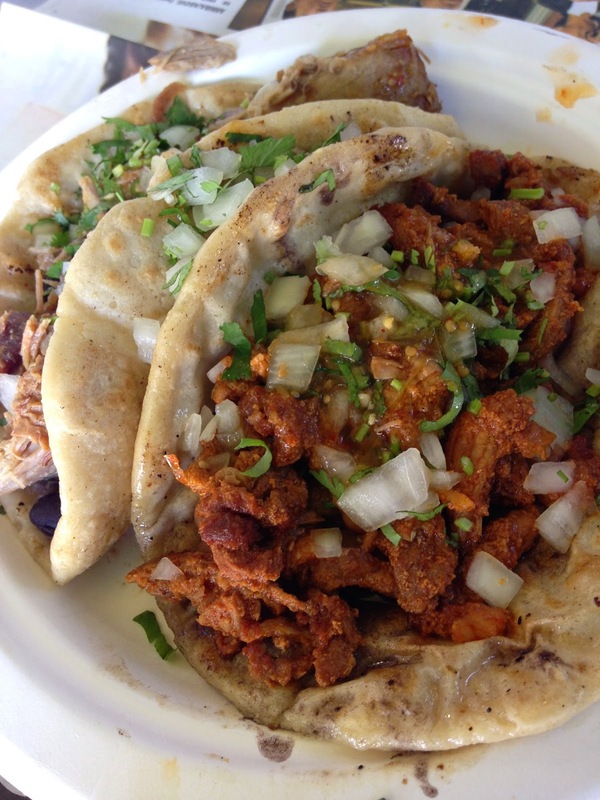 Upon our arrival we headed straight to The Mission for a self-guided taco crawl. After being given three recommendations from our San Fran friends Kacey and Mike, the BF and I decided to get a taco at all three. I mean, we had to do some research people! The first stop was La Palma Mexicatessen, which is more of a deli that also cooks food to order. The tortillas were pretty thick, almost like a pita. The tacos needed it because they were stuffed to the brim with fillings. 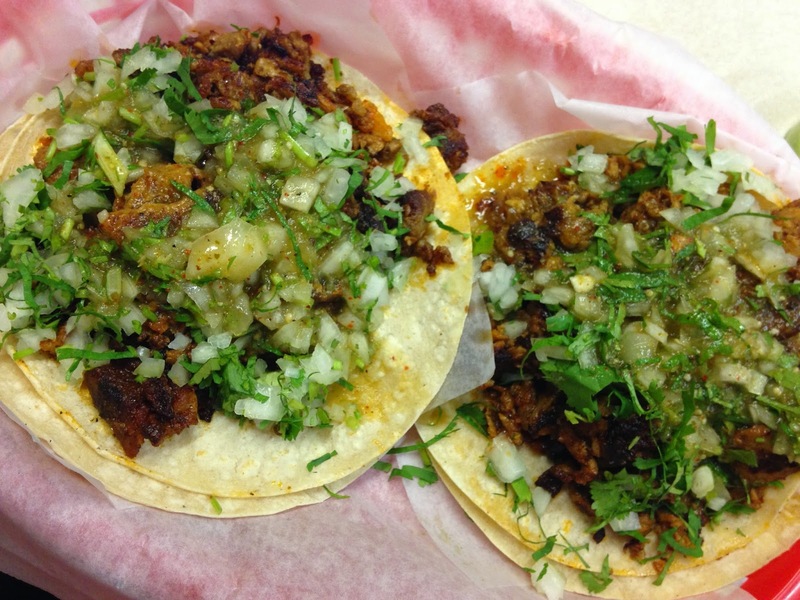 We tried one pastor and one carnitas. The pastor was the winner (pictured on the right below). 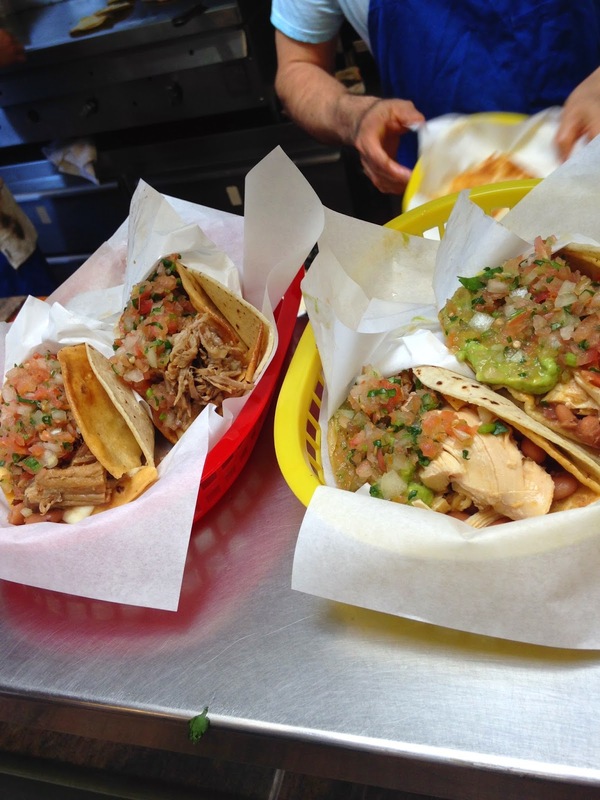 Our third and final stop is probably the most famous taco joint in the mission, La Taqueria. Yes, they have an unoriginal name, but they certainly make up for it with their food. We waited in a long line all for one pastor taco (we were pretty stuffed). I loved how you could watch them making the food right in front of you. It was an art form. I shared a video on my Instagram page if you're interested! 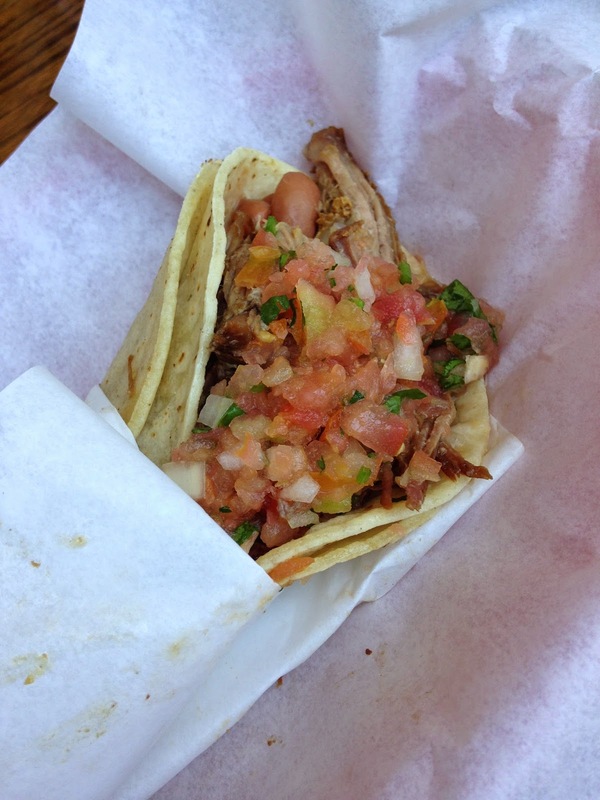 This taco came in second place for us. The meat was tender and smokey, but lacked the flavor that El Farolito offered. The price was certainly right though. Unfortunately it wasn't until AFTER I left La Taqueria that I was informed they won the title of America's Best Burrito on Nate Silver's FiveThirtyEight blog. Oops. Guess I have a reason to come back now! 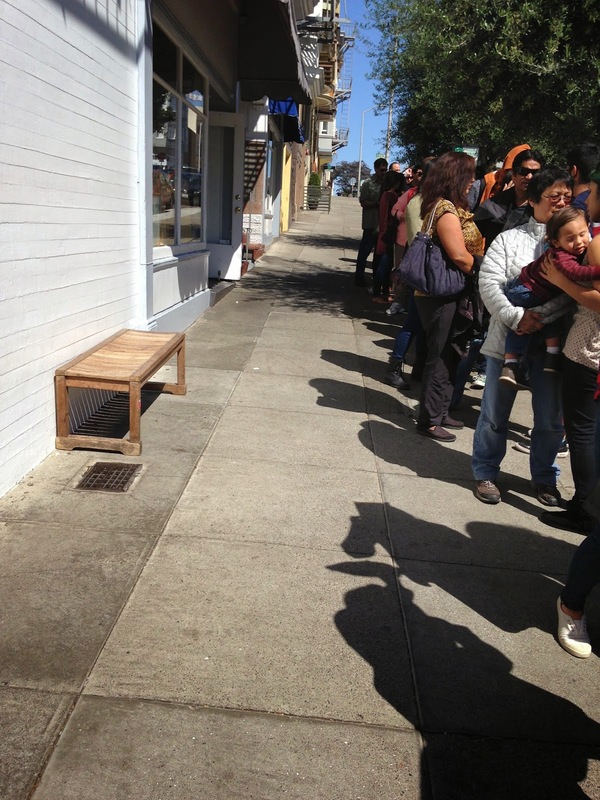 Post taco crawl, the BF and I walked off our lunch a bit before stopping into Tartine Bakery (and waiting in line). This was one of the places recommended to me, but I have to say I was pretty disappointed. While we specifically visited to get some bread, they don't sell any until after 4pm and we were there too early. Instead, we got a croissant (huge but just OK), a morning bun (huge but dry), and a slice of dark devil's food chocolate cake to celebrate Mike's birthday (dry dry dry). I may try their restaurant Bar Tartine but I really didn't get what all the hype was about. We wandered around The Mission, ultimately stopping at the top of Dolores Park for fantastic view of the city. Seriously, this view was awesome. It's a great spot to enjoy a sandwich or some ice cream (if you haven't already been on a taco crawl). Post Dolores Park, the BF and I made it over to Fisherman's Wharf to catch views of the bay and Alcatraz. We also enjoyed the friendly sea lions at Pier 39. That night we stopped for pizza and beers with Kacey and Mike at Toronado a craft beer lover's paradise. For breakfast the next morning we headed to Washington Square to stand in line for brunch at Mama's. Apparently this is one of the best spots for brunch in San Fran. However, it comes with a long wait. We waited more than 1.5 hours to get into the tiny restaurant. What did we do while waiting? Posed for photos and got sunburned! When we finally got inside, we ordered at the counter and got a seat near a window (thank goodness, it was abnormally hot for SF!). 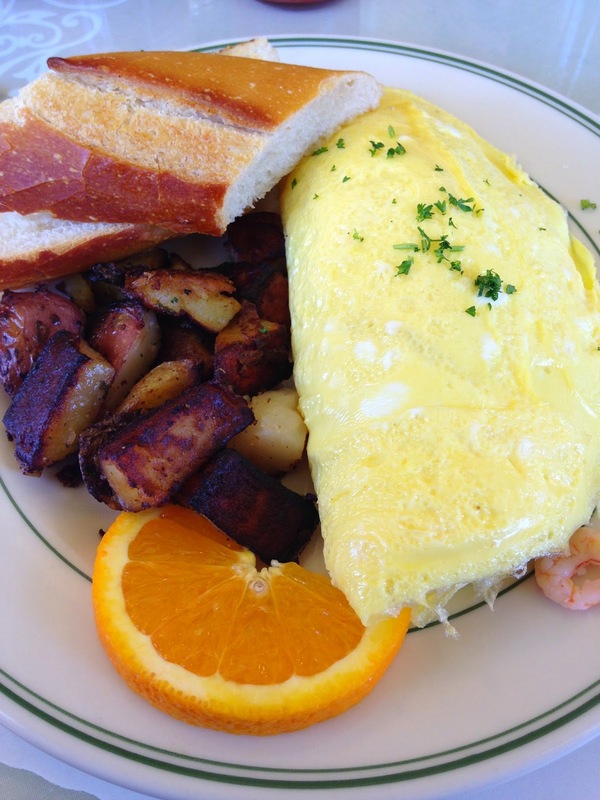 I tried one of the specials, a bay shrimp omelette with brie. It was delicious and filled with a ton of shrimp, but was it really worth the 1.5 hour wait? Nope. After spending all morning at Mama's, we met up with Kacey and Mike at the Presidio for Off The Grid, a weekly food truck gathering. The weather was picture perfect. We grabbed a spot on the lawn, enjoyed some music, drinks, and a Bi-Rite Creamery ice cream cake to celebrate Mike's birthday. No need for plates, we dove right in with our spoons and it was INCREDIBLE. 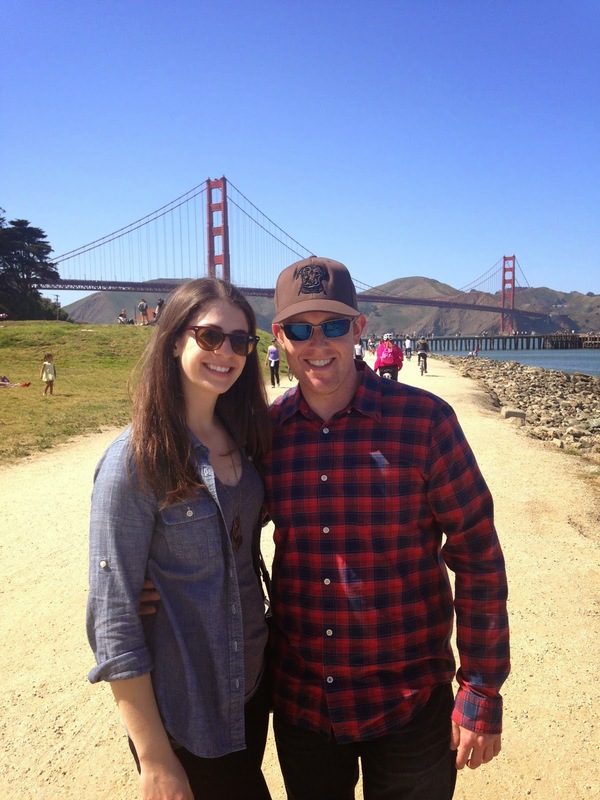 After soaking up the sun, we went to Crissy Field for a view of The Golden Gate Bridge. Again, I can't stress enough how gorgeous the weather was. We got fantastic photos with no fog! We stopped to take in views of Land's End and grabbed drinks al fresco at the Park Chalet. 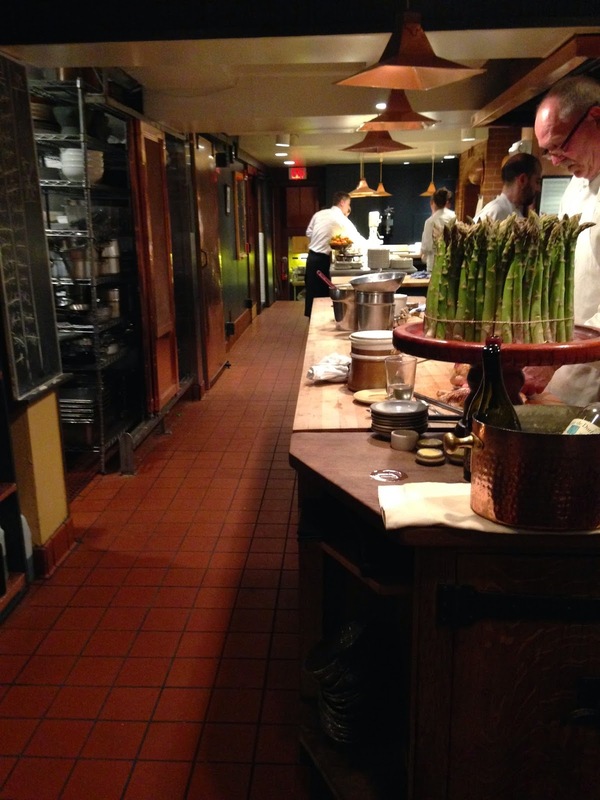 That night, the four of us went to Zuni Cafe. 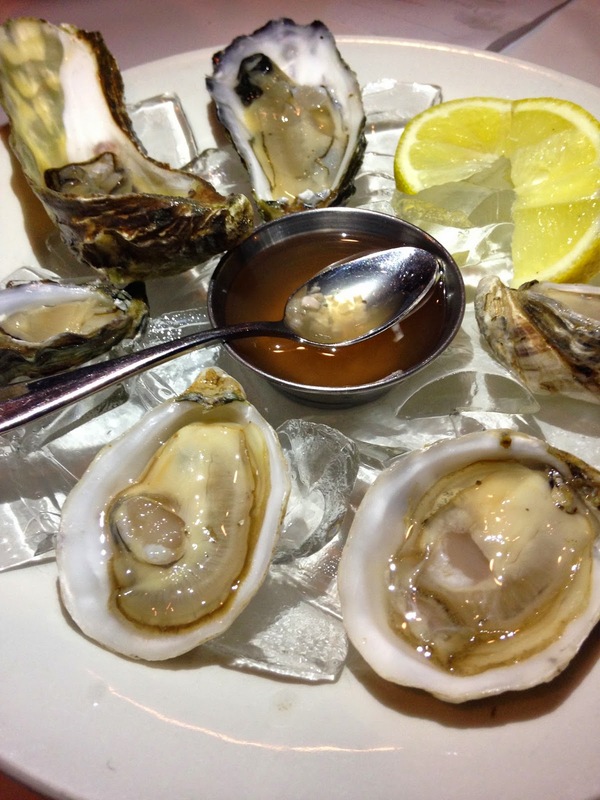 They have a fairly extensive oyster list so we ordered some of those, along with a refreshing arugula salad. 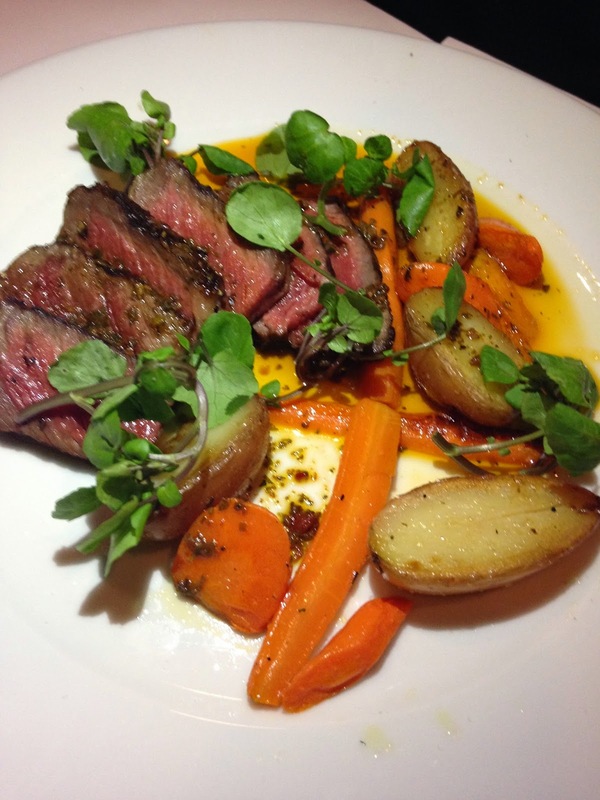 Mike ordered the hanger steak, which was delicious (albeit a smaller portion). 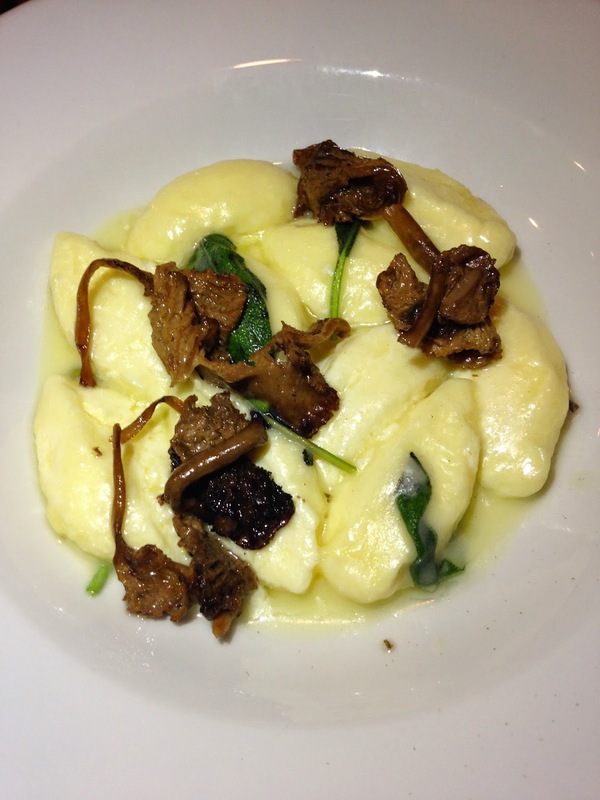 Kacey went with the gnocchi with mushrooms which were divine. 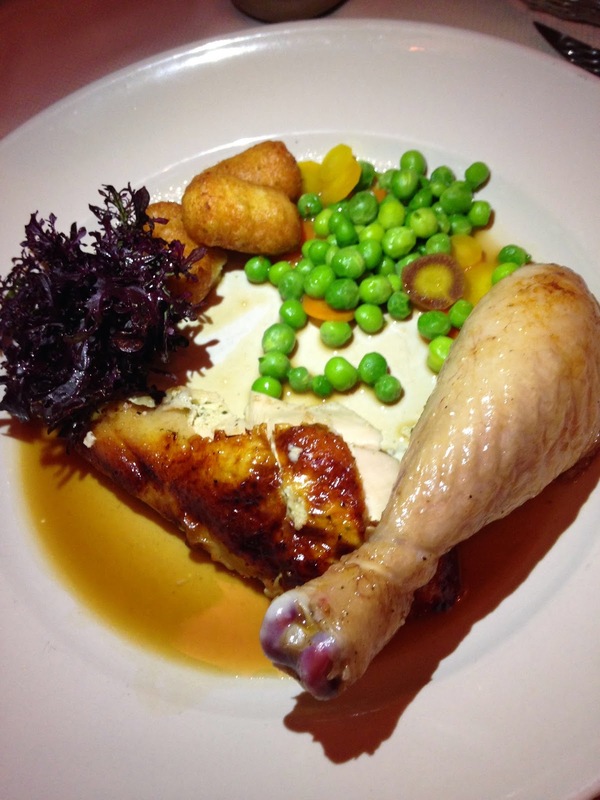 If there is one thing you need to order at Zuni Cafe, it's the roasted chicken for two. You get an entire chicken roasted in the brick oven served with a warm bread salad with scallions, garlic, mustard greens, dried currants and pine nuts. It's fantastic! We also ordered two sides for the table, creamy polenta with mascarpone and Parmigiano Reggiano, and shoestring potatoes. Our server asked if we wanted both cheeses in the polenta to which we said ummm YES. 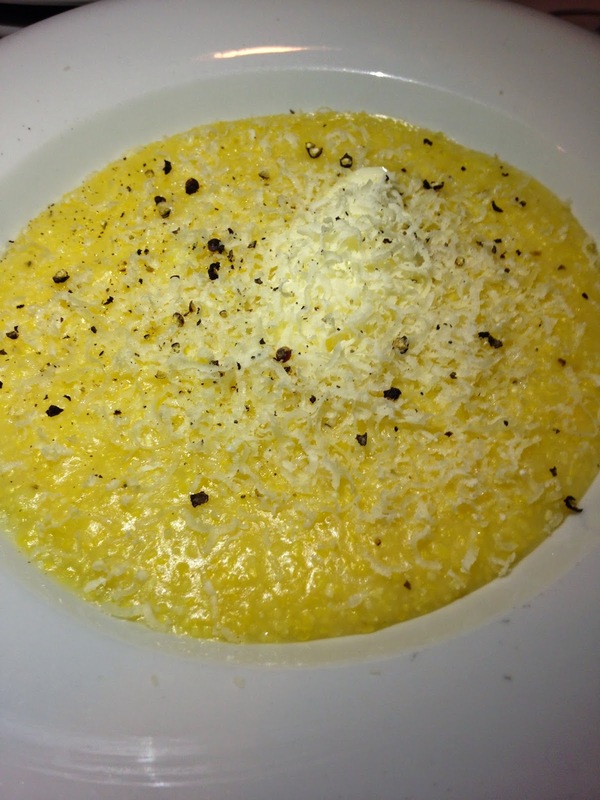 The polenta was amazing...so smooth and buttery and cheesy. 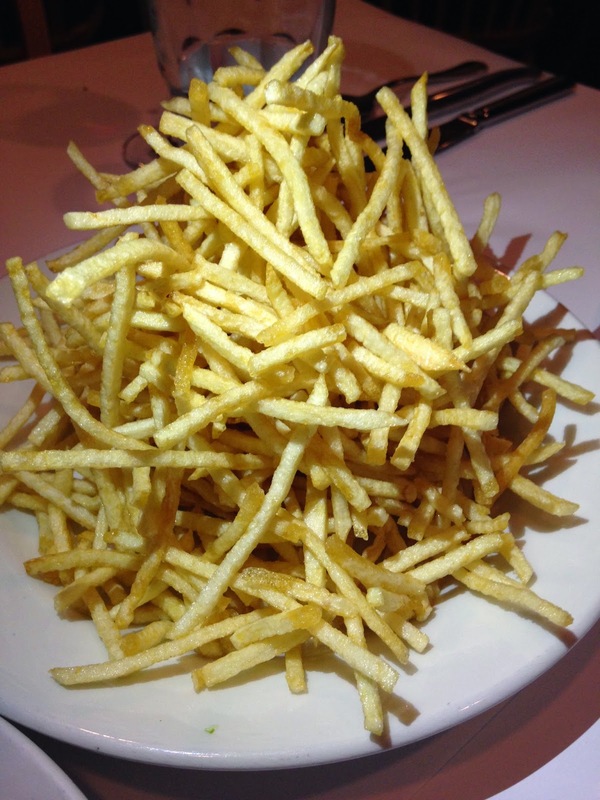 The shoestring potatoes were tasty but rather difficult to eat! I didn't get a picture of it because we demolished it, but we also ordered a flourless chocolate cake made from a Julia Child recipe. Holy crap it was incredible. 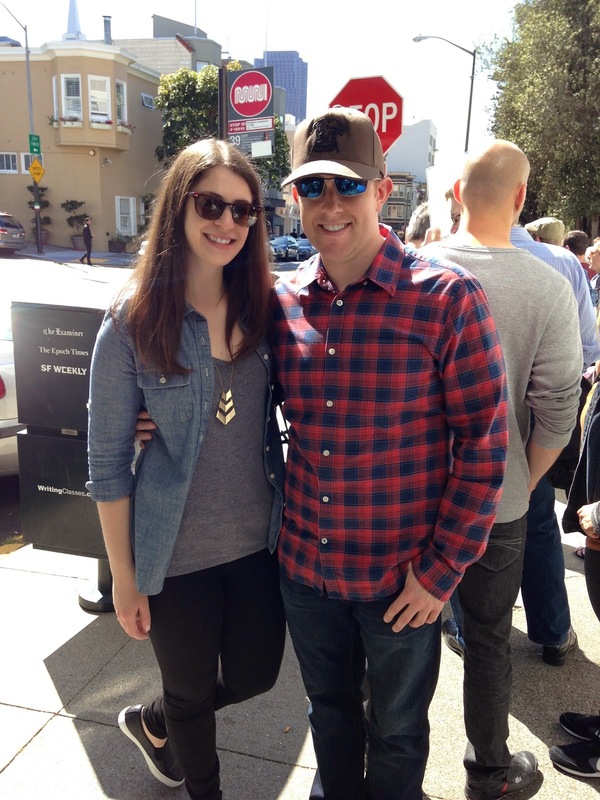 The next morning, the BF and I started our last day in SF with coffee and breakfast sandwiches at Blue Bottle Coffee. We've had their coffee in Chicago before (some restaurants like Chicken Shop carry it), but something about being in SF made it taste so good. 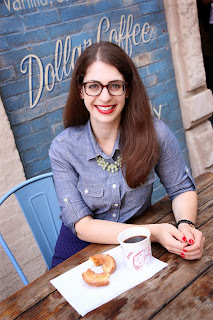 Forget those soggy breakfast sandwiches at your local coffee shop. 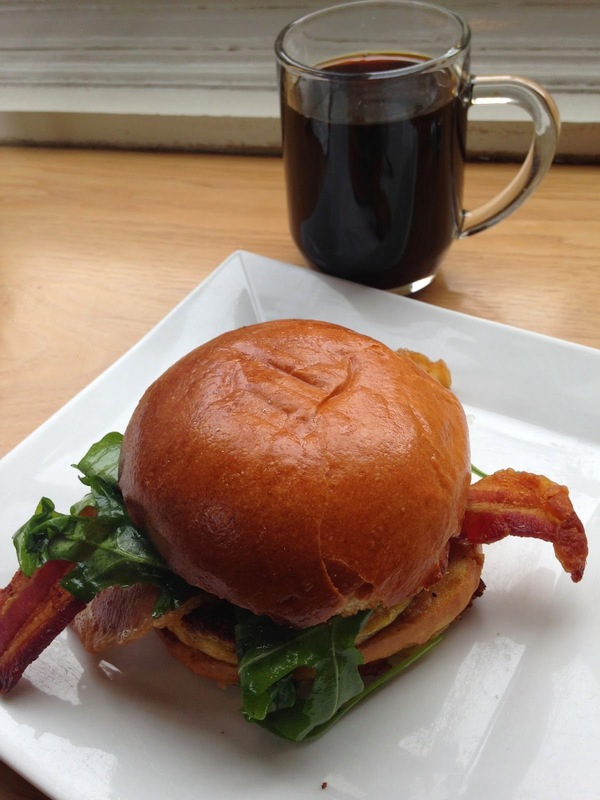 Blue Bottle's was filled with two slices of crispy bacon, frittata, spinach, and caramelized onion butter on buttery brioche! We fueled up before starting our tour of Anchor Brewing. The BF is a home brewer and we are both craft beer aficionados. Anchor Brewing is the first and oldest craft brewery in the US! It was so fun touring the brewery and learning about its history. Their beers are made in a traditional copper brewhouse. 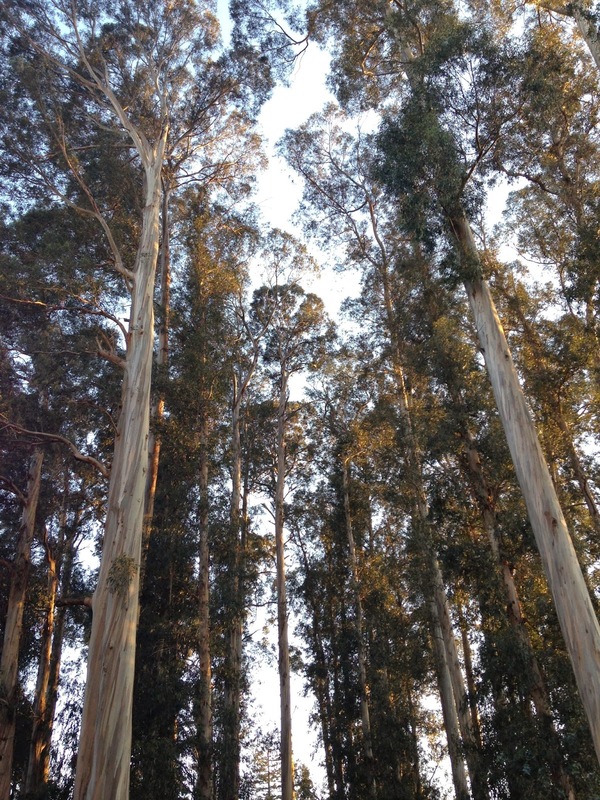 Another thing that sets Anchor Brewing apart from other breweries is its open air fermentation process. All beers ferment in open pans, cooled by air in the room where they're stored. No brewery tour is complete without beer samples. 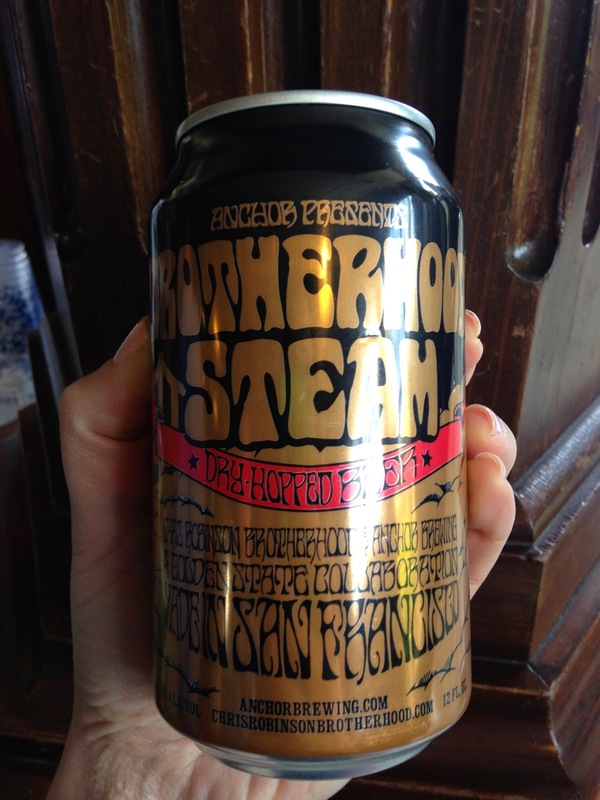 We definitely had our fill and even found a beer we really loved, Brotherhood Steam, a collaboration between Anchor Brewing and the band The Chris Robinson Brotherhood. After all those beer samples, it was time for some lunch. We stopped into Ike's Place, known for its massive selection of creative sandwiches. The menu is gigantic! While the store only displays a selection of the most popular sandwiches, there's also a secret menu with extensive options. 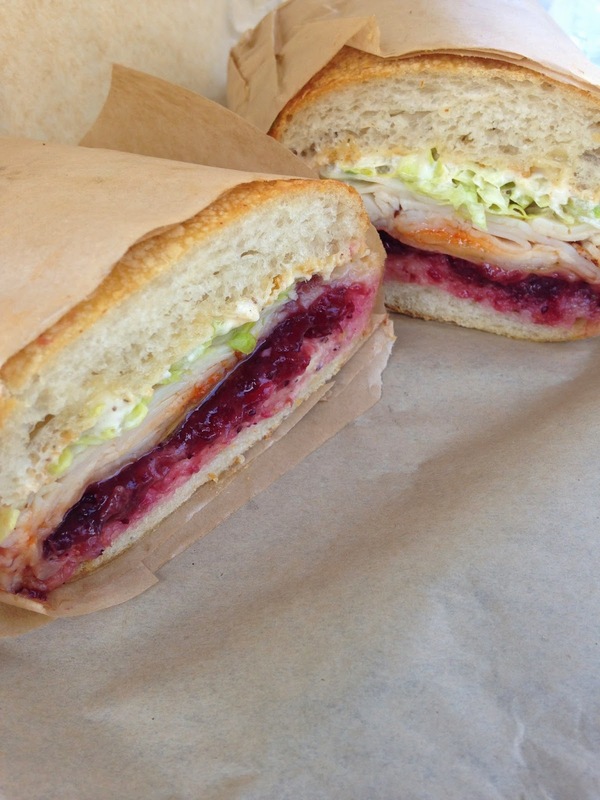 I tried the "Going Home For Thanksgiving" with turkey, havarti, cranberry sauce, sriracha, and Ike's "dirty sauce" which comes on all sandwiches. This sandwich was a monster but it was so delicious (and the bread so crispy) that I demolished it. For our last dinner before heading to Napa, the BF and I headed to Berkeley. 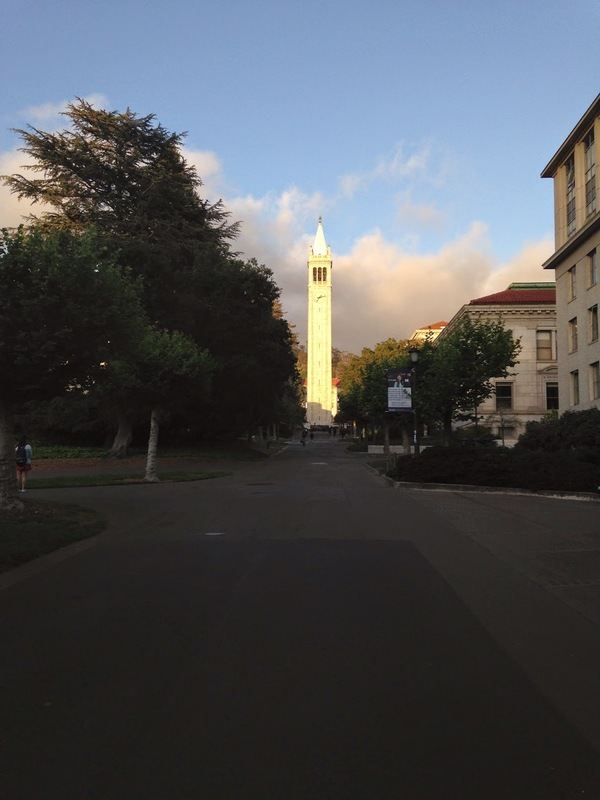 We had reservations at Chez Panisse but stopped first at the beautiful UC Berkeley campus to walk around. 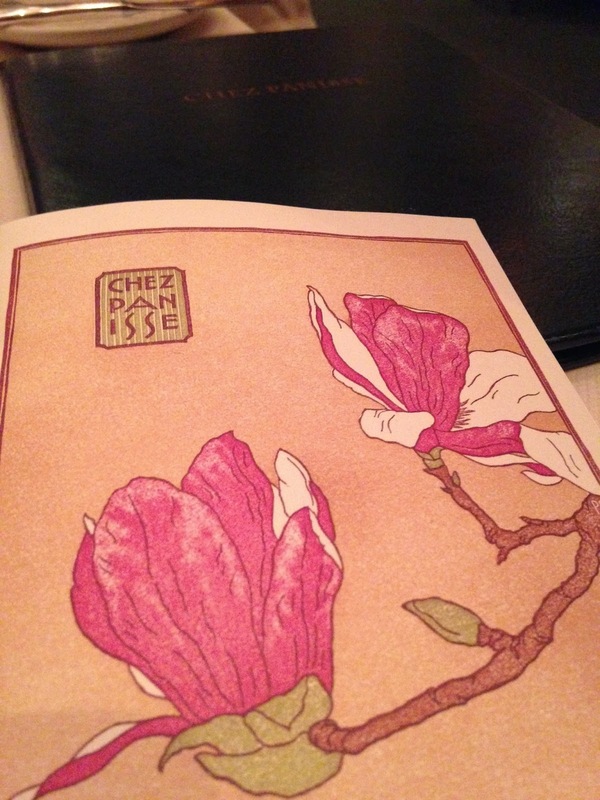 After our walk, we headed to Chez Panisse. This restaurant has been on my bucket list for awhile. Why? Chef, author and proprietor, Alice Waters, who pretty much pioneered the farm-to-table movement. 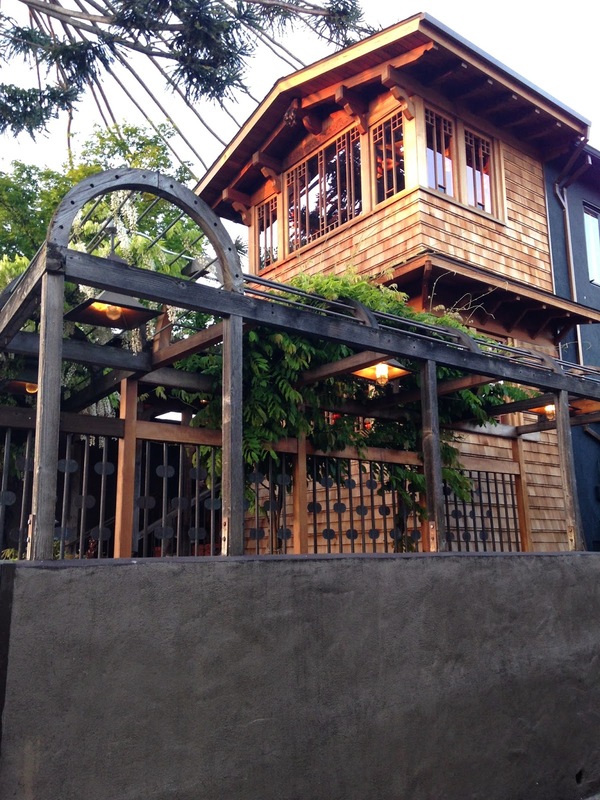 She opened Chez Panisse in 1971, way before eating local was cool. The restaurant is essentially divided into two operations, the downstairs restaurant serves a fixed dinner menu of three to four courses, while the upstairs cafe served an a la carte menu. 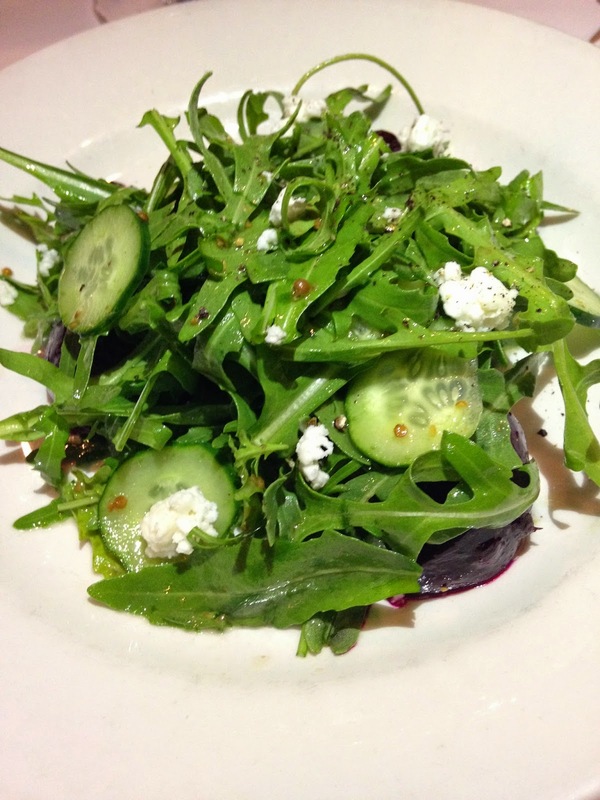 The menu changes every single night reflecting the best in sustainable, organic, and seasonal ingredients. Side note: upon entering the restaurant, who do we see but Rashida Jones. I may or may not have been completely starstruck. 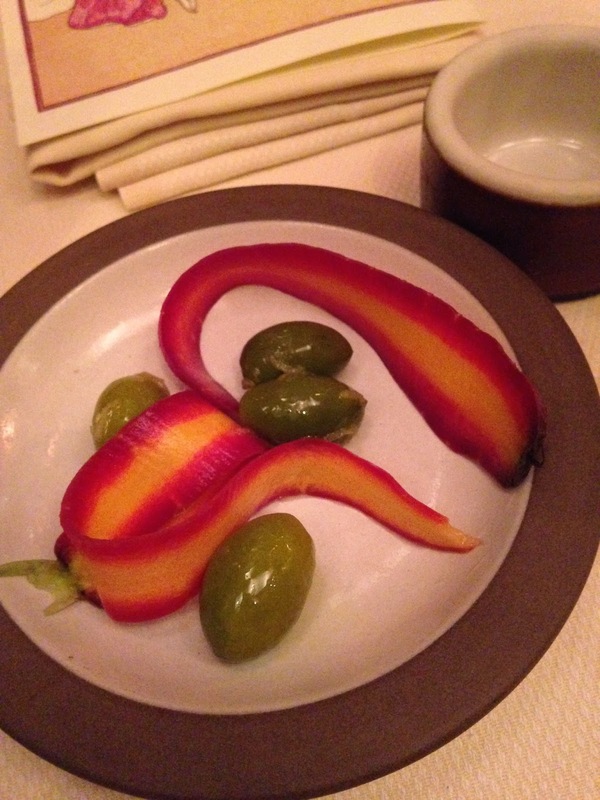 Anyway, we started with an amuse-bouche of carrots and olives from the restaurant's garden. 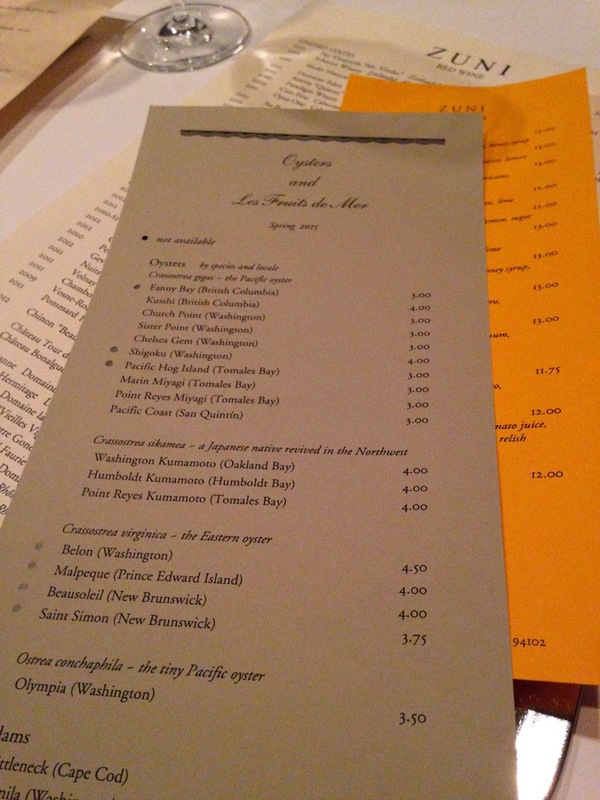 We dined on a Monday night which is a typically more rustic menu. 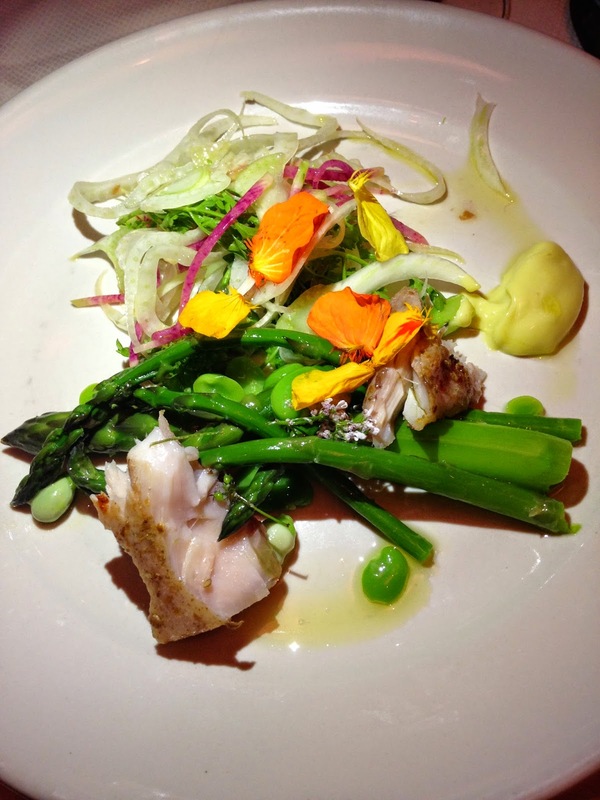 Our first course was an asparagus and fava bean salad with yellowtail jack, and green coriander vinaigrette. The plating of the dish was truly artistic. So much color (hello edible flowers) and flavor! I've never had asparagus like that. Just look at the color (I swear there is no filter). The yellowtail jack was fork-tender and I loved dipping it in the green coriander vinaigrette. Course two featured spit-roasted chicken stuffed with ricotta and herbs, and served with sweet peas, fried green garlic, and potato puffs. The dish was tasty but I was partial to the roasted chicken at Zuni Cafe. The potato puffs were like the best ever version of tater tots, and I certainly had no problem eating my peas and carrots. Before our dessert course we were served hot water with mint. 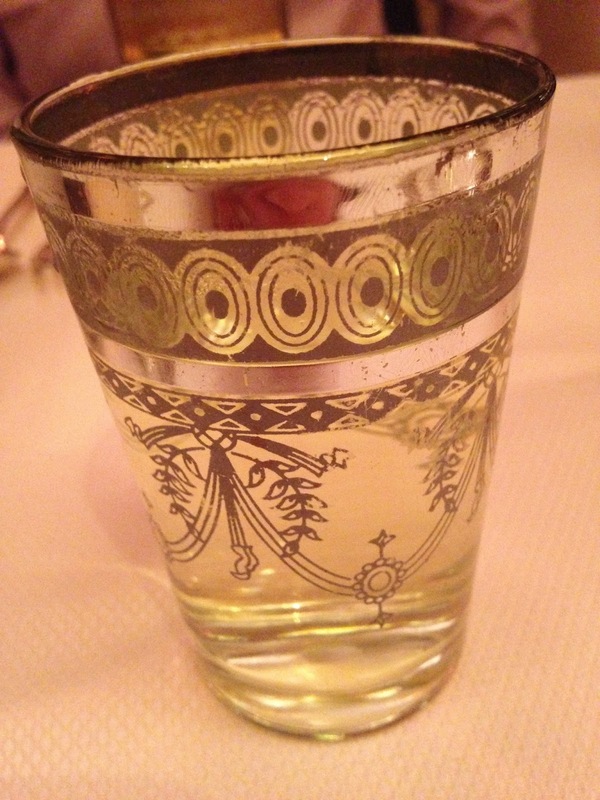 I just had to share the ornate glass! OK, dessert time. This was my absolute favorite of the meal (surprise, surprise). 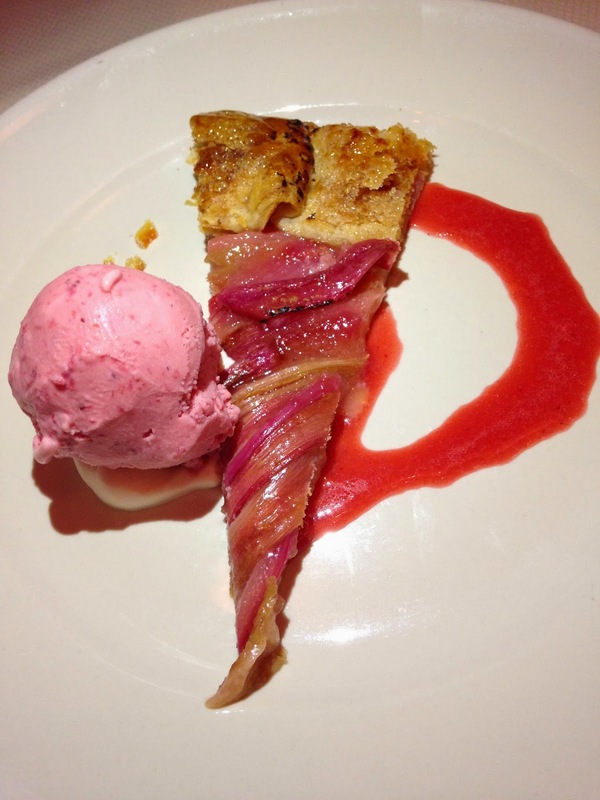 A rhubarb galette with strawberry ice cream. Holy moly. The ice cream was mind blowing. I kid you not, it was like eating the freshest picked strawberries. 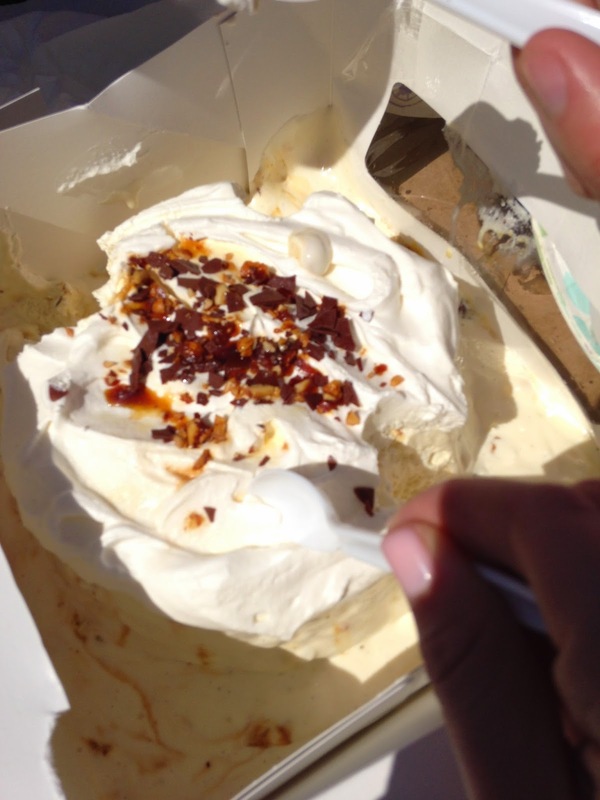 I'm still dreaming of it and the thought of the flavors makes me salivate. I loved the caramelized sugars on the galette crust, and that rhubarb filling? No words. We weren't done there. 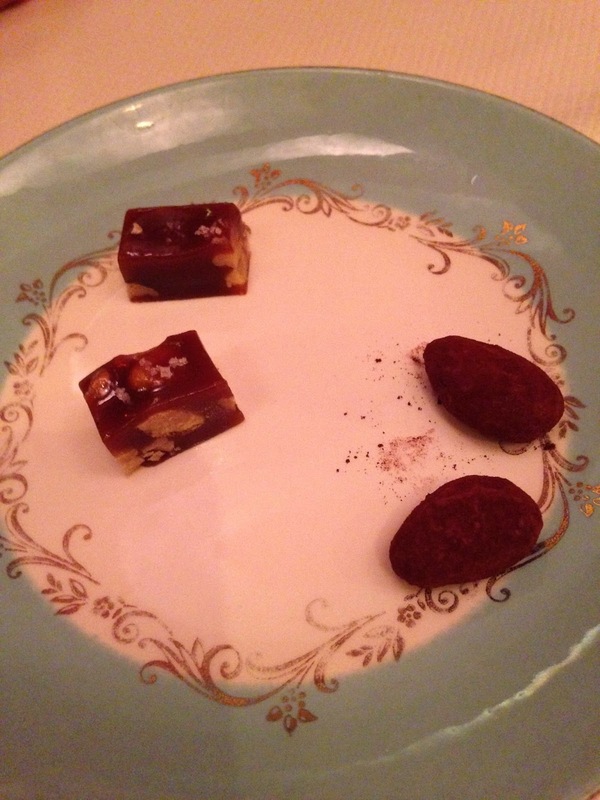 We also got some cute handmade chocolates and caramels to end our meal on a sweet note. Literally. On our way out, we popped our heads into the open kitchen where we saw the chickens roasting on the spit, and bunches of that gorgeous asparagus. Yes, I just called asparagus gorgeous. Screw flowers, get yourself an asparagus bouquet! Well that end's part one of our trip! Stay tuned for part two which picks up in Napa! Saving this for later! I'm going to San Fran in June! Nice! This is only some of the places we ate/drank so let me know if you want more recos Katie!